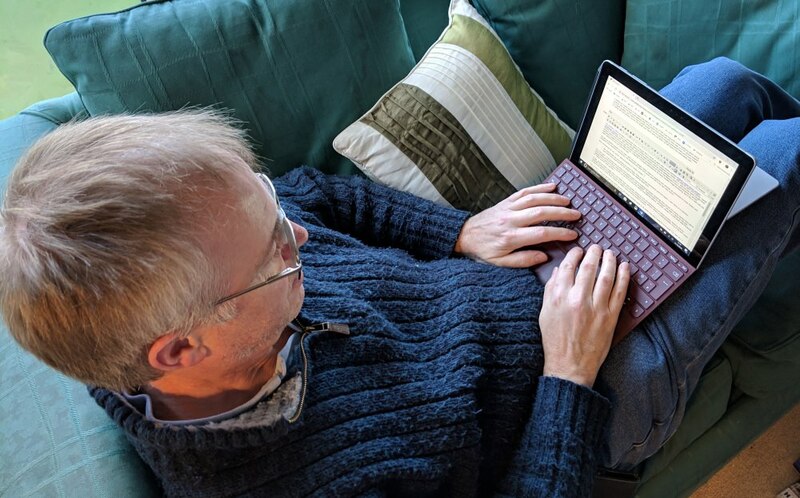 Russell Holly seems to be a kindred spirit in terms of loving the diminutive Surface Go, and I was interested in reading his recent anecdotal piece about his device and about how peoples' jaws drop when they see what it can do. True, it's not a 'phone', but it's an ultra mobile communications and productivity device - and that's good enough for me! A long day of work meetings has turned into drinks at the nice bar down the street. I'm not quite finished with the last thing I was doing, and I need to get these thoughts out of my brain before I forget them, so I toss my Surface Go in my bag. Twenty minutes into the evening, someone turns to me with a surprised look on their face and asks what device I'm using. Most people I work with are MacBook people, so the unusual shape and size of the Surface Go catch them off guard. ....But even when someone sees a Surface on display, there are often a lot of questions to follow. Is it a laptop, or a tablet? In person, I can hand them my Surface Go and show how it's a little bit of both. I keep my Surface Pen handy to show how nice it is to be able to grab screenshots and leave notes even if I'm not really all that artistically inclined. I've had jaws drop when I show someone how easy it is to remove and re-attach the keyboard, so I can use it as a recipe machine in the kitchen and a full writing workstation even when I'm in a cramped car. Seeing a Surface on a shelf in a store is so different than seeing it actually being used, so a lot of that utility gets lost in that traditional purchasing environment. Even among techy people, there are some super common misconceptions about the Surface Go. I can't tell you how many times I've rolled my eyes at the word "lapability" only to show someone that my Surface Go fits on my lap with no problems and no hinge hangover, like you might see with the larger Surface models. The same goes for those who tap their trusty MacBook and tell me they can't live without a backlit keyboard with adjustable brightness, only to see my Surface Go Type Cover does the exact same thing. My personal favorite is folks who tell me they've moved happily to USB-C and can't go back (with an iPhone X unironically in hand) only to blow them away as I connect my USB-PD battery to the USB-C port on the Surface Go to show this is usually the only charger I bring with me places, even when I know I'm going to be away from home for multiple days. If I've understood it right, Russell's Go is the smallest capacity and RAM, the 'base model', making his love for it all the more impressive.